The long and controversial saga of the Men’s Network attempting to affiliate as a Club is over. The Clubs Council voted almost unanimously to affiliate, with 5 votes against and 5 abstentions. In fact, though the Men’s Network’s was tipped to be a hot debate, it was two other societies – the Intercultural Dialogue Association and the Southeast Asia Society – that proved contentious. The Men’s Network’s first application to the new Clubs Council made headlines after it was rejected. Concerns had previously been raised over perceived misogyny in the group, and the President, Sebastian Rossi, expressing a desire to one day form a “Men’s Department” (Rossi later said he misspoke). The Network started last year in the form of a Facebook group. The group had a rocky start, with several posts creating significant conflict and being considered misogynistic by many, the moderation of the group has since become stricter, and content focusing on men’s issues and mental health is more common. Nick Blood, speaking on behalf of the Network today, distanced himself from the concept of a Men’s Department, saying “I don’t think that’s on our radar any time soon …. there’s no plan for that.” Blood also addressed concerns over “active MRAs [Men’s Rights Activists]” within the group, arguing that the Facebook group has a “very strenuous moderation process”. The affiliation bid instead stressed on the Network’s focus on men’s mental health and promoting positive healthy discussions around men’s issues. The Council, made up of one delegate from each Club, overwhelmingly supported the motion to affiliate. The Circle for Gender Equity notably supported the Network, stressing the need for positive male discussion spaces. “The Men’s Network is really important to have on campus” the delegate said, and pointed out that executives of the Network had reached out to ANUSA departments to discuss how to approach minority issues sensitively. More hotly debated at the Clubs Council was the new “Intercultural Dialogue Association”. Representing the club, Daulet Taimagambet said that despite the name, the club is “more about interfaith things”, and would likely join the Faith Branch of the Council. While the club had not yet run any events, he said they had been in contact with similar groups around Canberra, and were planning on holding a large interfaith dinner during Ramadan. Some delegates expressed concerns about overlap with the role other faith and cultural clubs. Jonathon Tjandra, Faith Branch Officer, spoke against the affiliation, saying they “have to clarify in what way you want to work with us”. 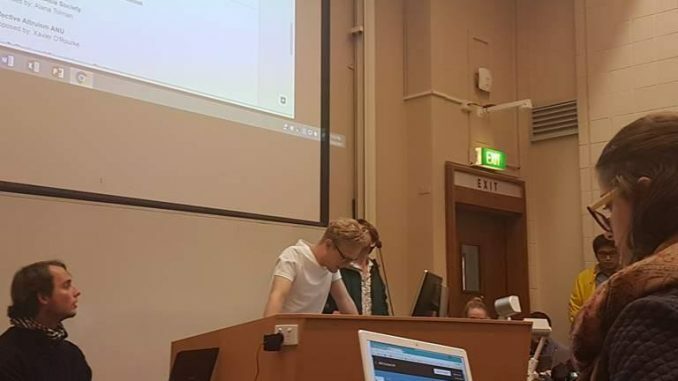 In a rare move, Social Officer and Council Chair Cameron Allan ceded the chair to speak for the club. Allan argued that the group would fill a niche as currently most faith groups are aimed at people of that faith, rather than interested students. Ultimately, the affiliation passed, but approximately one third of the delegates voted against or abstained. The ANU Southeast Asia Society (SEASOC) affiliation created conflict, with accusations the club was to compete with or replace ASEAN (Assocation of South East Asian Nations) due to students’ frustrations with that club. Alana Tolman, on behalf of SEASOC, explained that the group had a purely academic focus, and was aimed at people studying Southeast Asia as opposed to people from Southeast Asia. Harry Needham, CAP Students’ Society delegate, spoke for affiliation. ASEAN President Mel Casao claimed that “at the heart, it’s the same thing” as ASEAN. Casao pointed out that ASEA does run academic events, and is made up of many students who are not South East Asian, contrary to the implication of SEASOC. Casao, noting that identical clubs are against the Council’s affiliation policy, argued against affiliation, and said that instead of creating a new club, students should get involved with ASEAN. This prompted further conflict, as Tolman claimed that she and others had tried to run for the ASEAN executive, but received no response to their email nominations. She further claimed that the election result was not posted on Facebook, Twitter, or the website linked on their Facebook page, which “was selling sneakers” (Observer can verify this claim). Casao argued that Tolman and the others had not had attended the relevant election meeting, and that he had made efforts to arrange another meeting which were unsuccessful. Tolman explained she was in South East Asia at the time, hence the email nominations. SEASOC was affiliated by a comfortable margin. Other clubs affiliated today include the Drake Appreciation Society and Effective Altruism ANU. Observer apologies for any misunderstanding caused by this omission.